How to change the size of a needlepoint design. Access a printable PDF file of How To Change The Size Of A Needlepoint Design. If you are working from a chart then it is not difficult at all to change the finished size of your design. 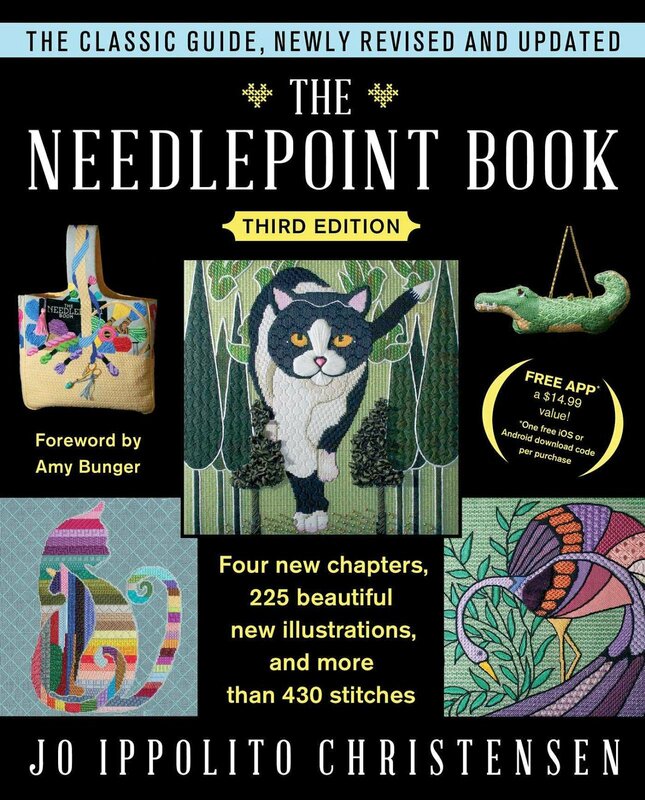 One way to do this is simply to change the needlepoint canvas size you are stitching on. For example, if the chart specifies a 13 mesh canvas and says the finished design will be 5" x 5", you can make your design bigger by stitching it on 10 mesh needlepoint canvas (this will make the adjusted size approximately 6.5" x 6.5"), or smaller by stitching it on 18 mesh needlepoint canvas (this will make the adjusted size approximately 3.6" x 3.6"). To do these calculations I simply figured out how many stitches there were across the original canvas (13 x 5 = 65), and then I divided this total by the new mesh size. e.g. 65 divided by 10 or 65 divided by 18. 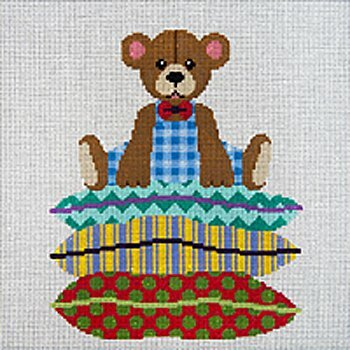 Another way you can change the size of a needlepoint design that is charted is by doubling the number of stitches. For example, stitch two stitches for every one stitch on the chart. This will double the size of your original design. 1. Take a color photocopy of your original design. 2. Enlarge or reduce this copy to the size you want it. Make another copy of the design, but this time put a sheet of graph paper into the copy machine so the design prints out onto graph paper. This way you will have a 'charted' design of your altered-size needlepoint design and you should be able to follow this chart to stitch onto your fresh piece of blank needlepoint canvas. Transfer the smaller/larger design to needlepoint canvas by tracing the new design onto blank needlepoint canvas. First, go over all the outlines on the paper copy you have made with a black, thick tip marker pen. This is so you can see the outlines when you place your fresh piece of needlepoint canvas over this paper copy. 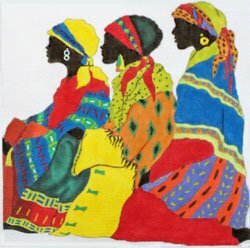 With your needlepoint canvas held securely in place on top of the color paper copy of your design, trace these outlines onto the canvas using waterproof colored markers. Try to use marker colors that are similar to the underlying design colors so that the outlines don't show through when you go to stitch your canvas. If you don't have colored markers, use a gray color to trace the design as this will not show through like a black marker will. Now that you have your outline drawn on your canvas you can either stitch in the details using the original canvas and/or the color photocopy as a guide, or you can hand paint the details onto your canvas. How you approach this will depend upon your personal preference and the type of design you are doing. For example, geometric patterns can usually be stitched without painting, but you might want to paint in more intricate design areas, or work from a 'chart' as explained above. We hope you have found these directions for how to change the size of a needlepoint design useful. Contact us with questions about how to change the size of a needlepoint design. We don't always have the answers but we are always happy to help of we can.